Mama Rose's Naturals Stardust Baby Powder shimmers with the healing powers of certified organic herbs and pure essential oils, which help deodorize while keeping skin dry and protected. It contains no talcum powder or cornstarch. Cornstarch, which is the most common ingredient used in talc-free powders, can feed yeast if present, causing quicker inflammation of a yeast infection. Instead, Stardust Baby Powder contains highly absorbent clay and powdered herbs to help keep baby dry and soothed. Suggested use: Sprinkle onto baby to keep skin dry and refreshed. For Diaper Rash: Keep diaper area clean, dry and exposed to the air as often as possible. Help cleanse and sooth with Sunshine Spray Skin and Diaper Care. Let air dry, and apply Magic Touch Skin and Diaper Balm. Sprinkle with Stardust Baby Powder for extra protection. 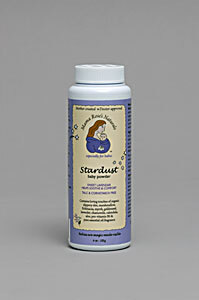 Stardust Baby Powder can also be mixed with water or plain yogurt to help relieve diaper rash and yeast infections. Ingredients: Stardust Baby Powder contains loving touches of white kaolin clay, arrowroot powder, baking soda, certified organic slippery elm, marshmallow, Echinacea, myrrh, goldenseal, calendula, lavender, chamomile, aloe and zinc oxide.